Students have always been a source of athletes for our international community. In 2018, for the first time, the best student pentathletes will be summoned to compete together and become part of history. 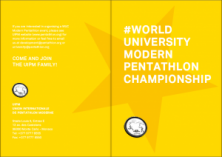 The inaugural World University Championships in Modern Pentathlon will be a unique opportunity to compete for honours in a world-class sporting event and will take place from July 04-08 in Budapest, Hungary (www.mpwuc2018.com). The athletes can compete in an Individual Tetrathlon event, a Mixed Relay Pentathlon event and in a newly-created Team Pentathlon event (consisting of four athletes, mixed-gender, each competing in one discipline). The competition will be organized by the Hungarian University Sports Federation and the Hungarian Association of Modern Pentathlon, supervised by UIPM and FISU, the global organization responsible for university sport. Since 2014 the UIPM is part of the FISU (Fédération International du Sport Universitaire – International University Sports Federation). The recognition and inclusion of Modern Pentathlon within FISU prompted a long-term project worldwide. A variety of educational and competition activities will strengthen and promote both federations global goals. Modern Pentathlon, and its sub-sport programmes, is implemented at selected universities. Educational material, equipment, knowledge and guidance – especially for the challenging Combined Event (Running and Shooting) – are provided. New technologies are shared. The collaboration goes beyond the field of play as both parties share common interest in education and development towards “excellence in body & mind”. Merging the educational spirit in sport and academic career are mutual commitments for both, FISU and UIPM. Character building aligned with essential academic and sport values. In addition to National university competitions a variety of international competitions for individuals or teams are frequently organized. To establish a series of international competitions will be leading up to the first World University Championships (WUC) in Modern Tetrathlon in 2018.